Final Fantasy Fables: Chocobo Tales' navigation is a bit of a mixed bag. The good: the opening sequence is short and download times are extremely quick and sometimes nearly instantaneous. The bad: the demos are located in "Send" and are not located in (or co-located in) "Multiplayer" (where people will be looking for them). The ugly: the back of the package talks describes the Single-Card Download player count as 2-4, where it's actually just the host and 1 to 3 guests downloading single-player demos. The labels and the areas that you tap on in the menu system are smaller than they needed to be, but that's to allow a more-than-sufficient buffer space. Each of the three "microgames" plays with a different control scheme. Bomberwall utilizes quick identification of arrow (quantity and direction) by tapping on the next block in the path. Cheese Chase is entirely based on vertical motion and controlled by blowing into the microphone. Job Juggler is a game involving identification of a fast-moving image from a list and tapping on it. All of these games work exceptionally well and almost always as expected. The music consists of some happy, jolly remixes from many of the early Final Fantasy games, and is either a great throwback (for those familiar with the series) or a nice, pleasant, upbeat background (for those not familiar with the series). The graphics are a mix of 2D and 3D with each of the three games maintaining their own style while still having similar elements. There are, however, only three microgames available via Single-Card Download - and they don't even have difficulty levels. The single-player experience in Final Fantasy Fables: Chocobo Tales is a fun experience with a lot of replay value. Unfortunately, that's not what I review. I review the Single-Card Download experience, of course. And (also unfortunately) the Single-Card Download play in Final Fantasy Fables: Chocobo Tales leaves a lot to be desired. Oh, don't get me wrong; the content provided is nice. There's just very, very, very little content provided. ON the back of the package, the game touts "FUN MINIGAMES - And microgames by the dozens!" but only provides three microgames, no minigames, and provides no Vs Play, no Co-op Play, and no multiplayer mini games (no multiplayer gaming at all) via Single-Card Download. Again, the problem is not that what's there is bad - it's that there's not enough there. The games that are there all include random elements (to ensure that it's never the same game twice. All three games involve quick thinking and timing-related reactions (encouraging you to try for a better score/quicker time). The problem is that microgames last almost no time at all. Three microgames will last three "no time at all"s. Square Enix has always been a great company with great success at making great games. Hopefully, if there's a sequel, the Single-Card Download aspect will look more like throroughly considered decision making and less like a nice, pleasant (but all-too-short) tech demo. Co-locate the "Send Microgames" option within the "Multiplayer" menu. Offer several difficulty levels per game. 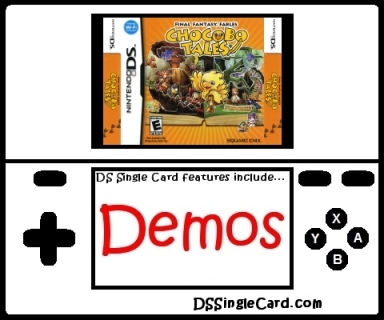 Click here to return to the DSSingleCard.com Final Fantasy Fables: Chocobo Tales profile.